The bells tolled on Saturday as tearful Christians crushed past the Cairo cathedral's gate hours after Pope Shenuda III's death, to get a glimpse of the man they called "father" in an uncertain time for the Egyptian minority. Within an hour of the announcement of his death, traffic was jammed for kilometres leading to the St Mark's Cathedral, where the spiritual leader of the region's largest Christian minority was based. The Copts, increasingly tight-knit in the face of assertive Islamists, displayed the crosses many have had tattooed on their wrists to get inside the church grounds and to the steps of Shenuda's offices, where they were told the pope's body lay waiting for the funeral. "We love you, Father," they chanted, hoping for a final glimpse of the pontiff who led their community since 1971. "The pope is wise, he was the father every young man, woman, widows and the orphaned," said Emil Essam, 28, his eyes red from sobbing. "We have had many crises, and he gave us wisdom throughout all of them. He prayed for us throughout our oppression," he said, turning his back to Shenuda's offices to face east to pray. The men and women chanted a mournful hymn in the ancient Coptic language and Arabic. "They're saying: 'God please save us, oh Jesus," said Isaac Zakaria, an 18-year-old university student. "He was like my father. He was wise, and very open-minded. There will be no one like him in the future," he said. Outside, policemen stood guard with sniffer dogs to detect explosives, a reminder of the dangers faced by the ever more beleaguered Christians in the Muslim majority country. Shenuda had come under unprecedented criticism by his flock after a suicide bombing killed more than 20 churchgoers in January 2011, weeks before a popular uprising ousted president Hosni Mubarak. He risked some of his credibility by supporting the increasingly unpopular dictator, and with his calls to turn the other cheek despite increasing sectarian attacks. Years earlier, the pope had been placed under house arrest by Mubarak's predecessor Anwar Sadat, who Shenuda denounced for courting Islamists. But Mubarak, the Coptic Church believed, acted as a bulwark against the fundamentalists who questioned the Christians' equality in Egypt. Misgivings about Shenuda's positions were overshadowed by a series of deadly blows against the Christians after the uprising that overthrew Mubarak. 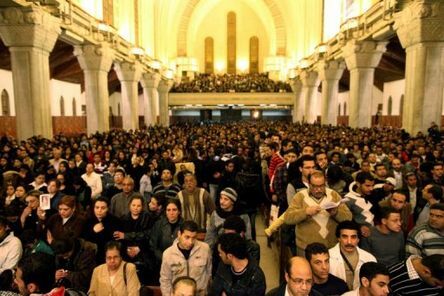 Those attacks culminated in a bloody clash in October with soldiers that left at least 20 Coptic protesters dead. They had been protesting against an earlier attack on a church in southern Egypt. On Saturday, the mourners said Shenuda had helped unite the country. "He was a patriot, first and foremost," said Osama Gamal.